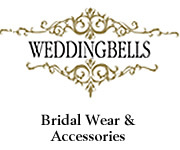 Are you considering tying the knot in the Maltese Islands? Let your love be symbolised by nature. 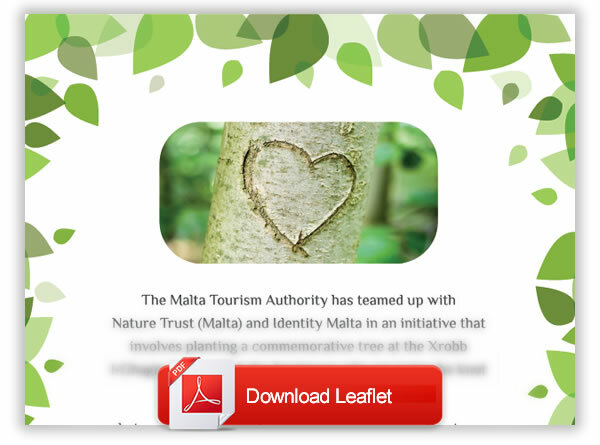 The Malta Tourism Authority teamed up with Nature Trust (Malta) and Identity Malta in an initiative that involves planting a commemorative tree at the Xrobb l-Għaġin Nature Park for foreigners who are getting married in the Maltese Islands. Let your union grow strong as your commemorative tree greens the Maltese Islands that witnessed your everlasting promise of love. Over the years, your living monument will grow and strengthen as it builds strong roots and provide shelter to local wildlife. A heart-shaped plaque with the couple's name, date of marriage or civil union and the country of origin will be attached to the tree. As a memento, couples will be also receiving a certificate with the photo of the tree or of the couple planting the tree. 1. Can collect their application from Identity Malta when submitting their application for their marriage. 2. Participants will be then requested to fill in the application form and send it to Nature Trust by email on info@naturetrustmalta.org or on loverstree@naturetrustmalta.org or by post to "Xrobb l-Ghagin Nature Park, Limits of Marsaxlokk, Marsaxlokk, Malta". 3. Couples can also contact Nature trust on (+356) 2165 3851 to schedule their tree planting event. They can opt to choose one indigenous tree, such as Aleppo Pine Tree; Holm Oak Tree; and Sandarac Gum Tree. A heart shaped plaque with the couple’s name, date of marriage and place of residence/s will be listed on the tree. Couples can visit the tree at the park or even be present, should they wish, for the planting of the tree. 4. 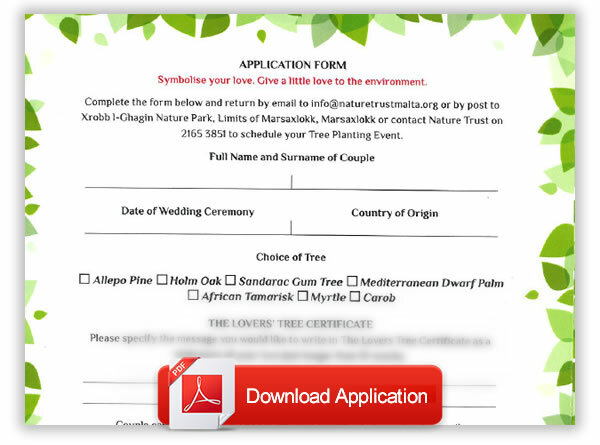 Applicants will be also given the option to receive a certificate with the photo of the tree or the couple planting the tree themselves by post of by email.